The Rolling Thunder 2 ball roller bowling bags by Storm feature high performance features. These features start at the top with the locking, telescopic handle with push button release and move all the way down to the 5" Silver Rally Wheels without skipping anything in between. 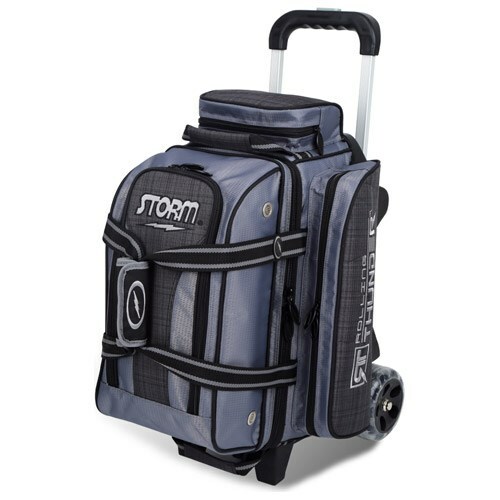 Storm has thought of everything you could want in a 2 ball roller bowling bag. Dimensions: W:12" x D:18" x H:23"
There are molded ball cups and dividers and a cover so they will stay in place. Is there a pocket on both side? Unfortunately, there is only the one pocket on the side. Yes, the wheels can be replaced but Storm would have to replace them for you. Does this bag have a warranty like some of the other Storm bags? Yes, there is a 5 year limited warranty for this roller. This bag will weigh up to 7-10lbs. How long does the handle extend, 36 or more? The Rolling Thunder double roller should have a 39" handle. Due to the time it takes to produce the Storm Rolling Thunder 2 Ball Roller Charcoal Plaid/Grey/Black ball it will ship in immediately. We cannot ship this ball outside the United States.